1. Create a directory where all movieset images should be saved. The directory should be created on the same device on which the movies are stored. Kodi must have access to this directory. 2. Place this directory in Ember as movieset artwork path. You can choose between the standards for the Kodi Interface and the Kodi Addon "MSAA". The two standards use matching and different file names. Also, DiscArts are not supported by MSAA. If you want use the MSAA to write the artwork paths to the Kodi database you have to use the MSAA settings. The Kodi Interface can send ANY paths to the Kodi database, also the MSAA defaults or custom file names from "Expert" settings. I would prefer the Kodi Interface standards. 3. To sync the movieset artworks with Kodi over the Kodi Interface you have to set the movieset artwork path also in the Kodi Interface Host settings. Caution: The path must be entered so that Kodi can find it. In most cases, the path must start with "smb: //" (or "nfs://","ftp://", "webdav://" or any other Kodi supported protocol, depending on your setting), especially if you are using MySQL. Also, the capitalization must be correct when using Kodi on Linux. 5. Now you're ready to scrape all moviesets. If you've enabled "RealTime Sync" in Kodi Interface Host settings, the artworks will automatically be synced. If you use the Kodi Interface without "RealTime Sync" you can select one or more entries and use Context Menu => Kodi Interface => Sync to sync it with Kodi. If you use the MSAA addon you have to run the addon on Kodi to write the paths. Kodi 16 and newer support Plot/Overview for MovieSets. This information can be saved in each movie NFO of a movieset. 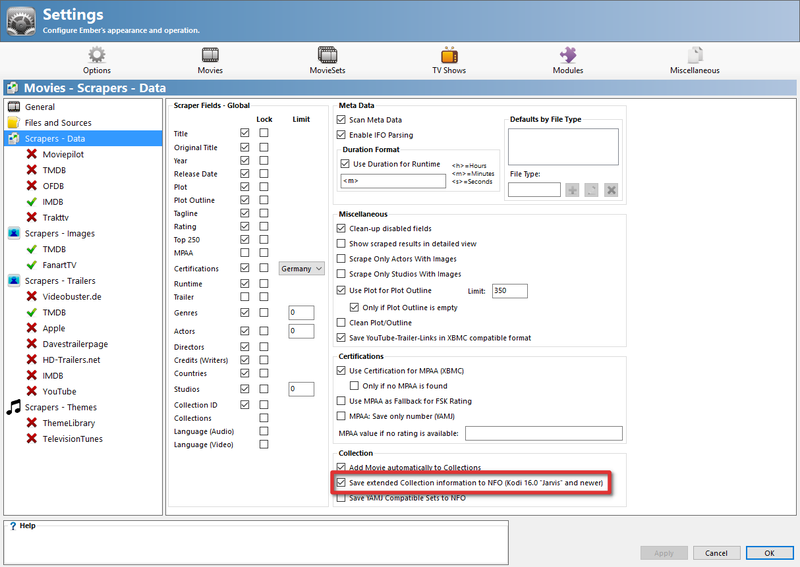 To write the data in the movie NFO you have to enable Settings => Movies => Scraper-Data => Collection => Save extended Collection information to NFO. - Rescrape e.g. Plot only for all MovieSets. All affected movie NFO will also be rewritten while saving the movieset information to the Ember DB. - Tools => Rewrite All Movie Content: That's exaggerated variant and will also rewrite all images, trailer, themes and so on. Also all movies without any set inforamtion will be re-saved. - Kodi reads the movieset plot from movie NFO only if Kodi needs to create the set. If the set is already created in Kodi's database, the plot information will be ignored. Ember also supports creating of movieset NFO, but I know no Mediacenter, which supports it. Movieset NFO can only be enabled if you set a file name in Settings => MovieSets => Files and Sources => File Naming => Expert => NFO.